Serving locals delicious home cooked food for over 14 years! 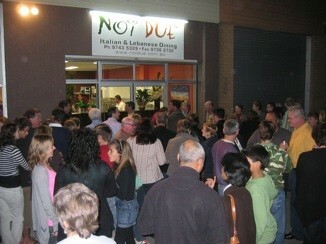 Noi Due Italian & Lebanese Dining is proudly owned and operated by Michael & Rofaline Saroufim. Michael & Rofaline have been members of the ‘Concord Community’ since the late 1980’s - originally owning and operating a very successful Fruit Shop at Cabarita Junction. Their hard work and dedication during the 13 years at this fruit shop was rewarded with the Rotary Club’s “Pride in Workmanship Award” in 1996. Working long hours over seven days interfered with quality family time, so the business was sold in 1999 to concentrate on raising and becoming more involved with their three boys. 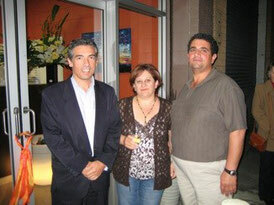 In April 2001, Michael & Rofaline purchased Noi Due Pizzeria. For six years, they nurtured this new venture and built it up to be well known (and loved!) in the local area. On September 3rd 2007, the Mayor of the City of Canada Bay Angelo Tsirekas officially opened the new Noi Due Italian & Lebanese Dining with the presence and support of the very special 200 plus guests. The grand opening was a night to be remembered. Since that time numerous special evenings have been held such as fundraising dinners, parties and themed evenings. Locals like to think that Noi Due Italian & Lebanese Dining is 'their little secret' but over the years more and more people have been coming across town especially to dine here and enjoy delicious home cooked food in a warm, friendly atmosphere. Michael and Rofaline look forward to welcoming you into their restaurant.